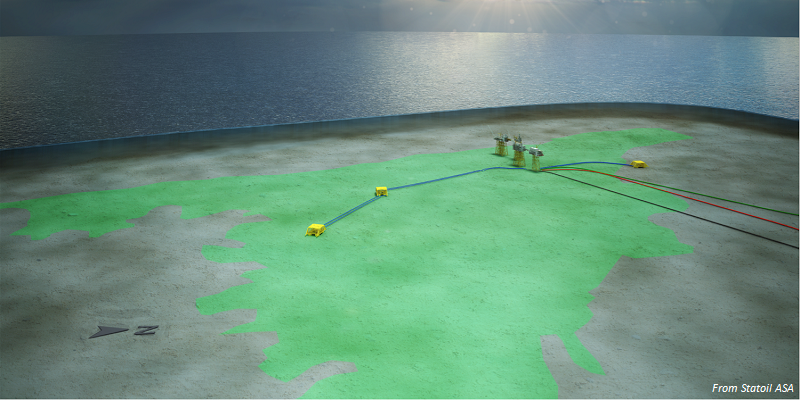 Partners Statoil ASA, Lundin Petroleum AB, Petoro, Det Norske Oljeselskap ASA, and Maersk Oil have submitted a plan for development and operation (PDO) for Phase 1 of Johan Sverdrup field to the Norwegian Ministry of Petroleum and Energy. The oil field will be developed in several phases. Phase 1 consists of four bridge-linked platforms and three subsea water injection templates, with a production capacity of 315,000-380,000 barrels of oil equivalent per day (boe/d). Production from Phase 1 is expected to launch in late 2019. The partners are targeting a recovery rate of 70%. Expected recoverable resources are projected between 1.4–2.4 billion boe. Capital expenditure for Phase 1 is estimated at 117 billion Norwegian kroner (about 15 billion dollar), which includes offshore facilities, oil and gas export pipelines, development wells, and power supply from shore. Twenty-two appraisal wells drilled on Johan Sverdrup have shown that the reservoir is of “exceptional quality” and multiple production tests also indicate well productivity will be “very high,” partner Lundin says. As a result, Lundin expects “very short” periods from ramp-up to plateau production for Phase 1 and subsequent phases. Phase 2 is expected to start production in 2022, with a production capacity of 315,000-380,000 boe/d. “We are delivering the PDO for the largest oil discovery on the Norwegian continental shelf since the 1980s,” said Eldar Saetre, operator Statoil’s chief executive officer. 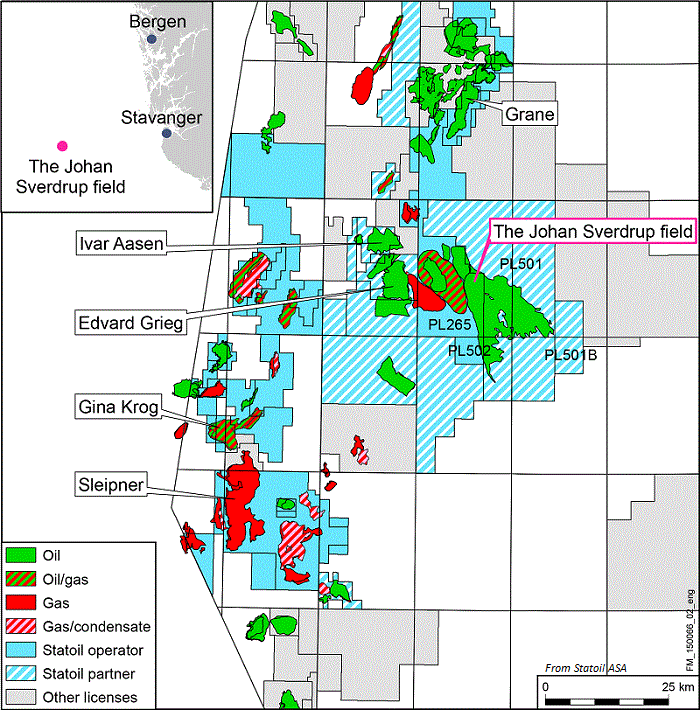 “Johan Sverdrup will generate value of great importance to Norway through several decades. The field’s economy is robust also at current oil prices.” The field’s breakeven price is $40/bbl. “Lundin in particular deserves credit for discovering the field in 2010,” Wood Mackenzie says.“ Overall, the field will provide 25% of Norwegian production by 2025, out-producing the entire UK sector. Intressant, med tanke på förutsägelserna att Norge snart “är torrt”. 25% av den totala oljeproduktionen i Norge år 2025. Hur många fat räknar man med att Johan Sverdrup innehåller, hur mycket av vår världs förbrukning? Hur många dagar av världens behov innehåller JS? Skulle kanske vara bra om du visade de siffrorna också, många, som inte är “i branschen” har svårt med bedömningar och beräkningar. I’m confused. So there are max. 2,4 billion barrels of recoverable resources? And pumping at max 380,000 barrels/day? So that will keep them going for 17 years approximately – or 8,5 years if phases one and two go parallel? But with world consumption at roughly 100 million barells/day, we’re talking adding 24 days world oil consumption with this “Norwegian Bonanza”? Now further to this, the article says that this is 25% of Norway’s production to 2025, so if all goes well, and these estimates hold (they don’t seem to most of the time but let’s cut them some slack), we are talking about increasing the recoverable oil for another 100 days (well, actually 96 days) of world consumption? And this is “outproducing the entire UK sector”??? And this is a big deal? Olle and Christer, as part of the upper limit 2.4 billion is gas and condensate they use the unit oe, oil equivalent. As daily consumption we can use BP’s number 86.8 Mb/d and that give us 31.7 billion barrels as consumption over a year. The 2.4 billion oe is 27.6 days and as you can see, your numbers are correct. In 2020 we need 20 Mb/d new oil. The 0.38 from JS is just 2%. The world need 50 new JS in 2020.